Top 10 Things To Do In St Kitts - Caribbean & Co. The beautiful island of St Kitts has the distinction of being the first Caribbean island to be colonized by the British in 1623 and as such is known as the “mother colony of the West Indies.” Situated roughly 1,300 miles southeast of Miami, Florida with a land mass of 65 square miles, the island which changed hands numerous times between the British and French gained independence from Britain on September 19th, 1983. St Kitts has a population of approximately 55,000 and attracts roughly 120,000+ stay-over tourists to the island each year. An additional half a million cruise passengers also visit the island each year. With that in mind, highlighted below are the top ten things to do in Kitts whose formal/official name is actually Saint Christopher. I’ve included a few beach attractions, but the majority of the recommended things to do in St Kitts have cultural and historical significance. 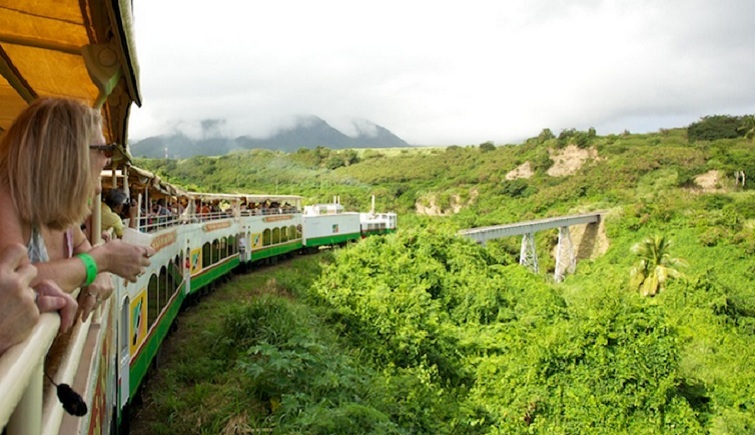 The St Kitts Scenic Railways offers visitors a glimpse of the real St Kitts as the route is 18 miles by rail and an additional 12 miles by bus which makes a complete 30-mile circle of the island. This near 3-hour tour allows visitors to get a glimpse of many of the island’s villages plus famous and historic sites including Brimstone Hill Fortress. Also on the route are spectacular views of the ocean, lush rainforest and many of the long-abandoned sugar cane estates, windmills, and chimneys which date back 350 years to when sugar production original began on St Kitts. It was to transport the sugar cane crop from these estates to Basseterre that the “Sugar Train” was originally built between 1912 and 1926. Then when sugar production on the island stopped circa 2005, the train was turned into the St Kitts Scenic Railway per agreement with the government and a private entity. Now those visiting the island of St Kitts whether as a stay-over tourist or cruise passenger can experience this one of a kind historic train ride in the Caribbean. The St Kitts Scenic Railway has two levels. The bottom level is air-conditioned, which is great for those steamy days. The top levels are open-air, covered and provide wonderful views of the mountains and the ocean. Alcoholic drinks along with soda and water are provided on the train. Singing trios come through to entertain the guest. The guides on the train are more than happy to tell you all about the places you pass, the villages you go through and the history of the island. As you travel, locals love to wave and be waved back at so throw up your hand and enjoy the ride. The Brimstone Hill Fortress National Park which was known as the Gibraltar of the Caribbean in its heyday was built over the course of 100 years by African slaves mostly under British command. This started circa 1690 when the first cannon was mounted on Brimstone Hill to recapture Fort Charles from French occupation. Numerous battles were subsequently fought to control the island’s profitable sugar industry with the most famous in January 1782 when 8000 French soldiers attacked the fortress. Over 1000 British soldiers and African slaves fought bravely for a month before surrendering on 12th February. A year later per the Treaty of Versailles, the fortress and island were returned to the British who continued with the fortification until 1794. British troops continue to be stationed at the Brimstone Hill Fortress until it was abandoned circa 1852. Now a UNESCO World Heritage Site of historical, cultural and architectural significance since 1999, the Brimstone Hill Fortress National Park is one of the most expansive and well-preserved British polygonal style fortification in the Western Hemisphere. Visitors can walk to the top and wander through the courtyard and tour the old officer quarters and see the huge cannons facing out to sea. From the high vantage point, it is easy to see why this spot was chosen for a defensive fortress to be built. 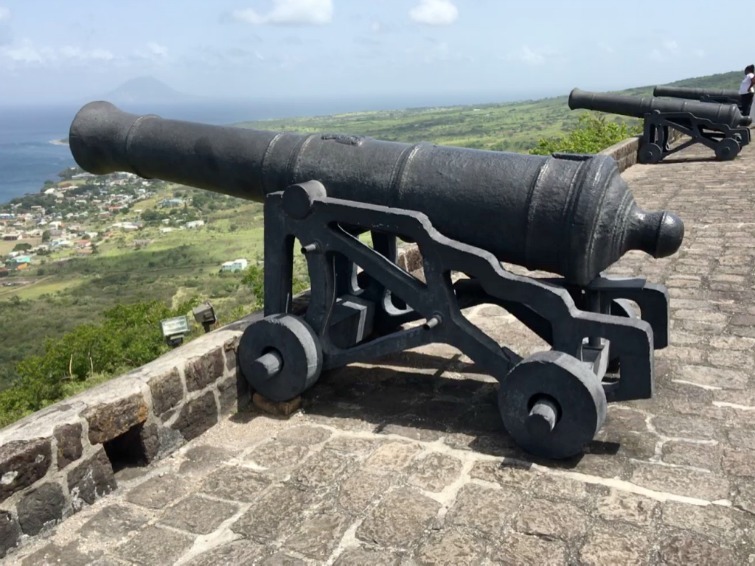 In fact on a clear day, spectacular views of the surrounding mountains and five neighboring Caribbean islands including St. Barts, St. Eustatius, Saba St Martin and federation island Nevis can be viewed from Brimstone Hill Fortress National Park. Note: To book tours, activities, and things to do in Saint Kitts, visit our travel partner Viator. 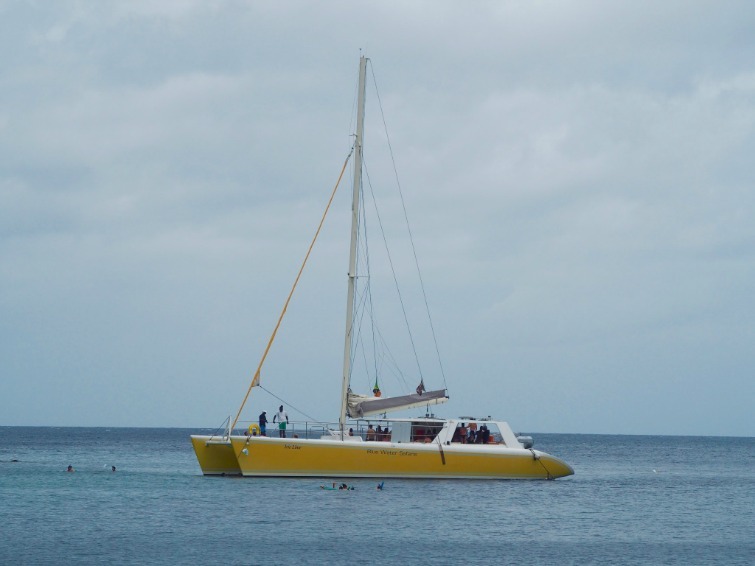 For a scenic view around the coastline of St Kitts, consider a Catamaran Cruise as it is a great way to see many of the secluded bays, coves, and the rich sea life, as you swim and snorkel the clear blue turquoise water of St Kitts. It is also a great way to learn more about the history of the island. For example, if you take a Catamaran Cruise with Blue Water Safaris, one of their stops is Shitten Bay. This picturesque small bay on the southeast coast of St Kitts which has a visible shipwreck and where it is possible to easily see the coral and numerous colorful fish as your snorkel is also the original location where slave ships from the Western coast of Africa docked before their entry into the capital harbor, Basseterre. The captain of the slave vessel would do so to inspect his “cargo” to see who was alive and then prepare them for sale. Basically, after the treacherous journey across the Atlantic, the captive Africans were brought on deck to be inspected, resuscitates, cleaned, oiled and then transported to the slave market in Basseterre for sale at the highest price. Of course, none of this is visible/known from just looking at the now calm blue water and picturesque surrounds of Shitten Bay. 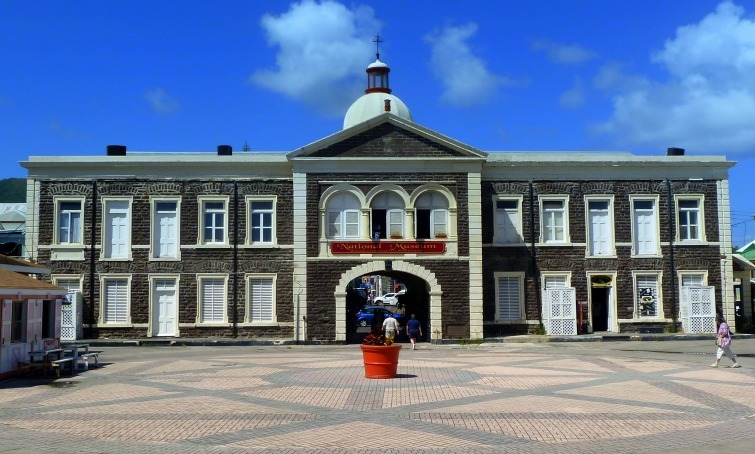 The St Kitts National Museum is located in the Old Treasury Building one of the largest public buildings in the capital of Basseterre. Constructed in 1894, this historic and architecturally significant building which replaced a wooden structure was known as the ‘The Gateway to the Island’ as it has an archway through which people who were arriving and leaving the island would pass. Also, over the years it has housed many ministries and department of governments. 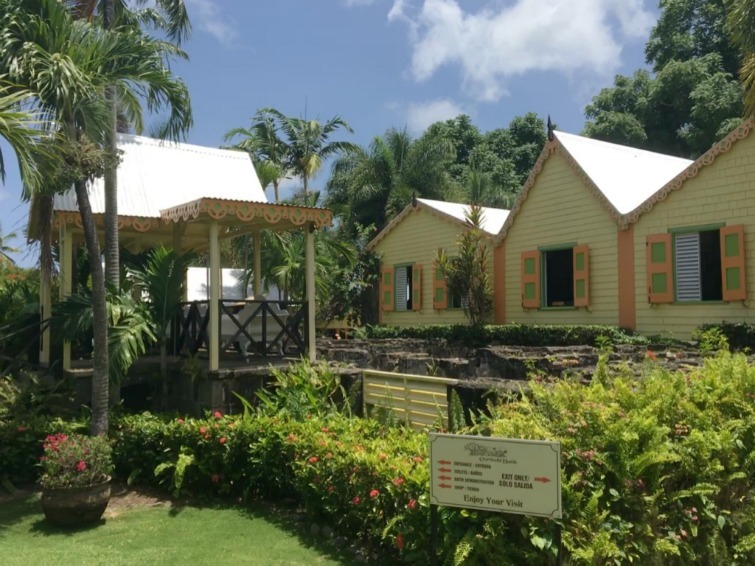 Run by the St Christopher Trust since opening in 2002, the St. Kitts National Museum now houses an expanding array of artifacts showcasing the island rich culture and heritage from the sugar and slave trades through its modern day independent status. 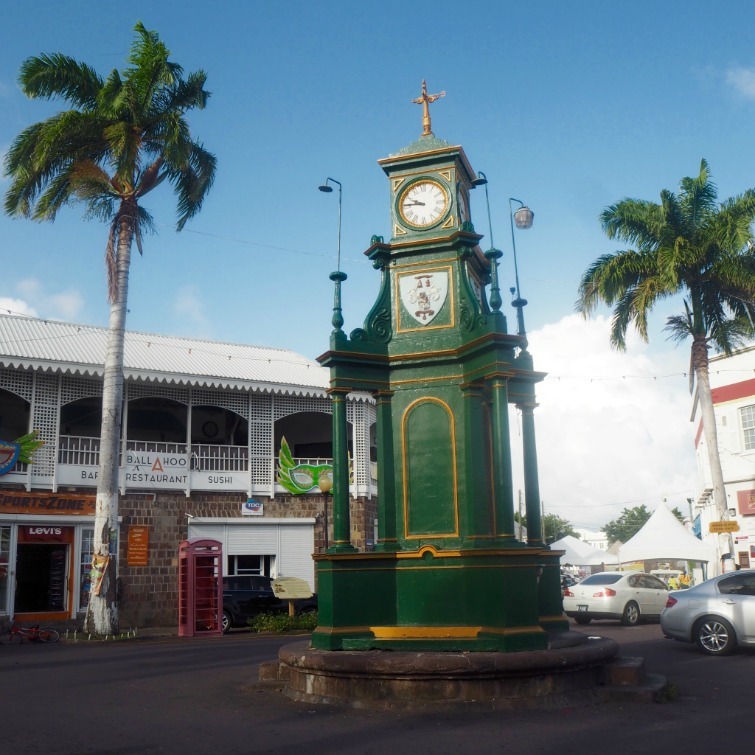 With a tour of the St Kitts National Museum complete, spend a few hours exploring the historic capital Basseterre which has applied for UNESCO World Heritage Status. Founded circa 1625 as the first French town in the Caribbean, here French and British colonial buildings are reminiscent of a finer era. See the main Independence Square which was previously known as Pall Mall Square where slaves were once auctioned off to the highest bidder — many of these same slaves built the Brimstone Hill Fortress. One building of note located across from Independence Square is the Basseterre Co-Cathedral of Immaculate Conception. This beautiful and grand Roman Catholic church constructed out of gray stone was built in 1928 to replace numerous churches damaged and destroyed during the Anglo-French war. Beyond Independence Square, wander around and marvel at the architecture on Basseterre’s lively and bustling streets like Liverpool Row, College Street Ghaut, Princess Street, Rosemary Lane, etc. Snap a photo of the Victorian-style Berkeley Memorial Clock located in the Circus, a roundabout inspired by London’s Piccadilly Circus. This Berkeley Memorial Clock, by the way, is for the former president of the General Legislative Council, Thomas Berkeley. Depending on the season, be adventurous and purchase some Caribbean fruits like Julie (Polly) mangoes, guineps or sugar apple from one of the street vendors near the market in Basseterre. You won’t be disappointed by their delicious taste. For unique and authentic souvenirs of St Kitts, consider stopping in at the Amina Craft Market and shops along Port Zante which can be quite busy when cruise ships are in port. Also, time permitting, wander over to El Fredo’s Restaurant & Bar for some authentic and mouthwatering Caribbean food. 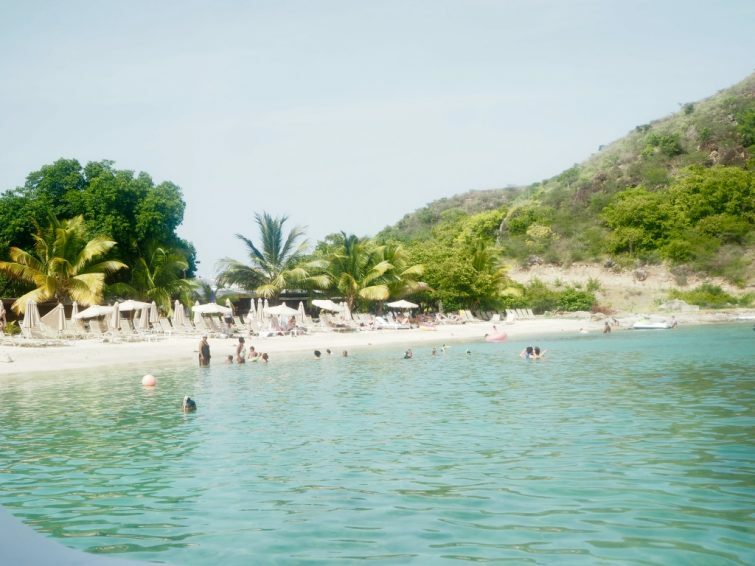 For pure relaxation in St Kitts, I recommend visiting The Stip on Frigate Bay. Frigate Bay is actually two areas. 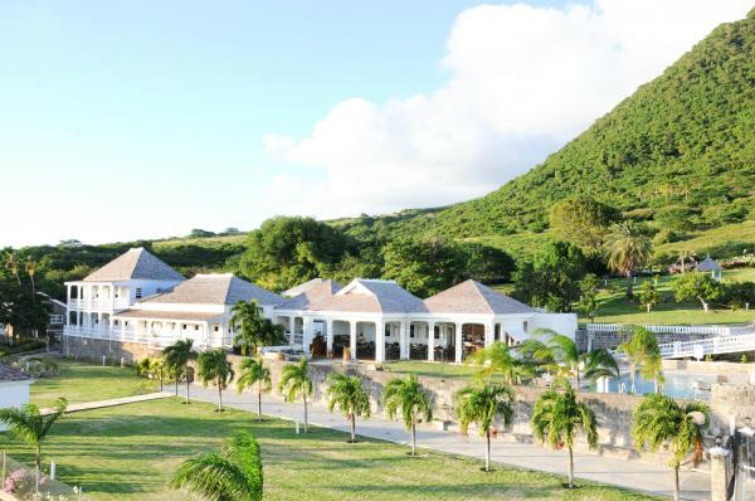 The North Bay faces the Atlantic Ocean and is home to the luxurious St Kitts Marriott Resort & The Royal Beach Casino. The South Bay on the Caribbean Sea which has The Strip is popular with locals and tourists alike, and there is a long stretching white sand beach along with numerous restaurants and bars. Many of the restaurants like Boozies On the Beach and ChinChilla’s Mexican Restaurant & Bar are open early. So you can come for lunch, hang out on the beach or rock up during the evening, especially on Friday nights to relax and shoot the breeze Caribbean style. The 18th-century Fairview Great House and Botanical Gardens in St Kitts is set on two acres of land and is beautifully restored. With original foundation dating back to 1701, you can stroll through the mansion where each room is painted a different color and is filled with period furniture including the dining room with its sixteen seat mahogany table and antique silver service. Plus the original kitchen and bath still stand today. Notice in the bathroom that heated rocks were used to heat water for the tub. The Botanical Garden is large and well maintained. Plus there is an on-site restaurant which is very popular for people wishing to have afternoon tea and sandwiches while taking in vistas of the sea. Much of St Kitts is picturesque and lush green. In particular, the Central Forest Reserve National Park which covers 25% of the island and includes all land 1,000 feet above sea level. Due to its vastness, it has many scenic vistas and is home to the islands African Green Velvet Monkeys and 926+ plant species – 45 of which are endemic to the island and the Lesser Antilles. The Central Forest Reserve National Park is also an important source of water which is pumped into Kittitian homes after flowing down the deep sided openings of the mountains and hills into a reservoir. With protection status since 2006, the Central Forest Reserve National Park is a great place to go hiking, mountain biking or zip lining with Sky Safari Tours. 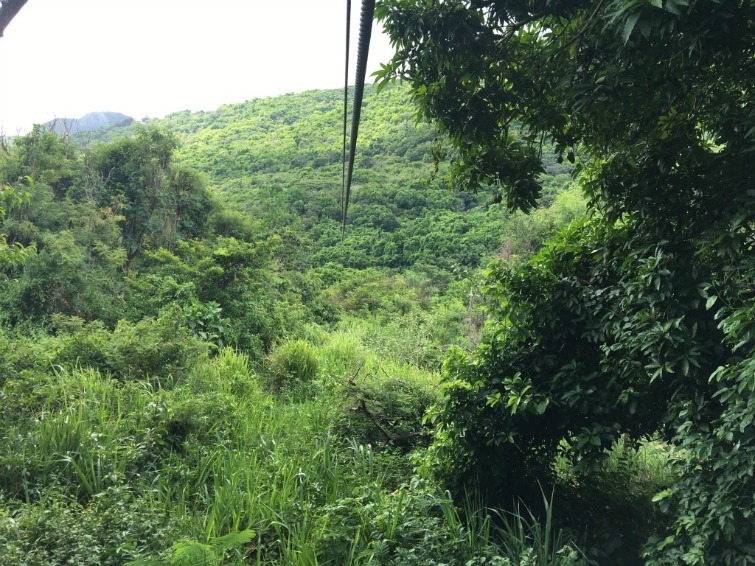 The full tour which takes about two and a half hours has five different zip lines including 1) The Monkey Trainer zipline – 140 feet long, 2) The Boss zipline – 1,320 feet long and 250 feet above the valley floor, 3) The Mango Tango Zipline – 1,000 feet long, 4) The Brimstone Blast zipline – 900 feet long and 5) The River Rocker zipline – 500 feet long. The views from the five lines but in particular the Boss Line are breathtaking not just of the rainforest valley but also out to the sea. So definitely one to experience while in St Kitts provided, of course, you are not scared of heights. As you drive around St Kitts to visit the many tourist attractions, stop to take photos of picturesque vistas like Timothy Hill which provides a fantastic view of the Atlantic Ocean on one side and the Caribbean Sea on another. Also, stop to take photos of historic sites like Bloody River were one of the largest massacres in the Caribbean took place. Here in 1626, a plot by the native Caribs led by Chief Tegremare was foiled. Their plan was to eliminate the British and French who they felt were invading their island. However, the plan failed, and nearly 2,000 Caribs met their death from the combined French and British forces. For three days it was said that the blood of the Caribs continuously flowed through the river. The Romney Manor Sugar Estate is a 17th-century plantation that is now home to Caribelle Batik where artisans craft tie-dye clothing. Here, visitors can see live demonstrations of the Batik process as artisans paint on the fabric. Gorgeous pillows, clothing, and other souvenirs are made from the paintings, all of which can be purchased. With the shopping done, explore the grounds of the estate which has a beautiful garden and pathways for wandering through the magnificent trees. The beautiful Saman Tree in the front of the estate is said to be 400+ years old. 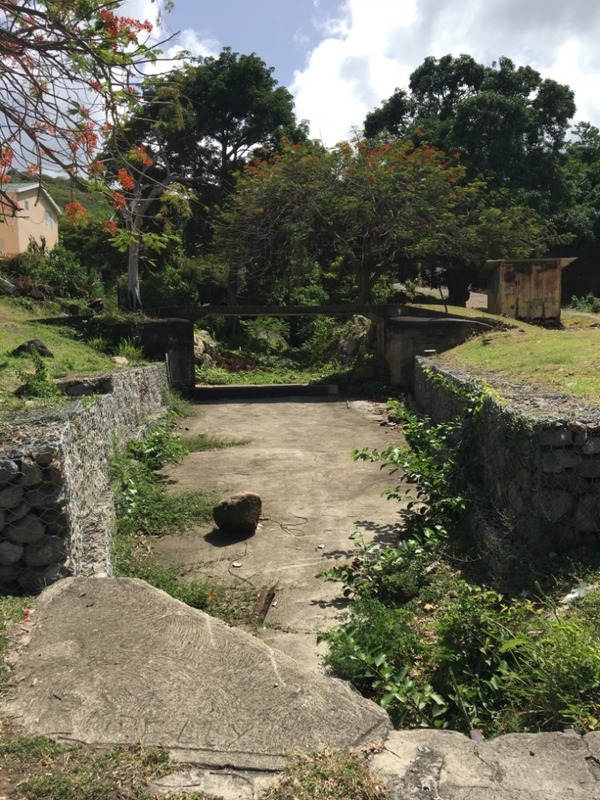 It should be noted that the Romney Manor Sugar Estate was originally the dwelling place of Kalinago Chief Tegraman who provide food and shelter to the original British settlers — Thomas Warner and his men — when they arrived on St Kitts in 1623. After the British and French combined to murder Chief Tegraman and 2,000 Caribs, the property was occupied by Sam Jefferson who leased to the Earl of Romney. The estate then became one of the richest on St Kitts producing tobacco, indigo and later sugar and sugar byproducts including rum. Finally, beyond a visit to the bars and white sand beaches on The Strip, no visit trip to St Kitts is complete without spending an afternoon at one of the other stunning white beaches that surround the island. This includes South Friars Beach with its amazing sea life including squids and urchins or Cockleshell Beach with its nursery rhyme name and views of Nevis. 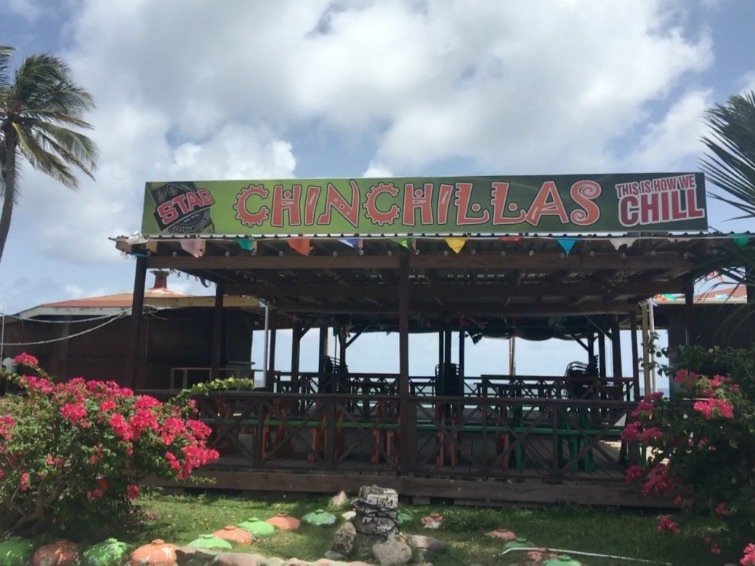 Next to Cockleshell Beach is Reggae Beach Bar & Grill which is a great place to hang out and drink a few rum punches, eat some fresh fish and seafood while taking in the beautiful scenery. These are but a few of the top tourist attractions on the beautiful Caribbean island of St Kitts with lush mountainous interior regions and picturesque rolling coastal plains. So start planning your vacation to St Kitts. There are many regional and direct international flights to St Kitts from North America (Atlanta, Miami, New York, Newark, Charlotte, Toronto) and Europe (London). 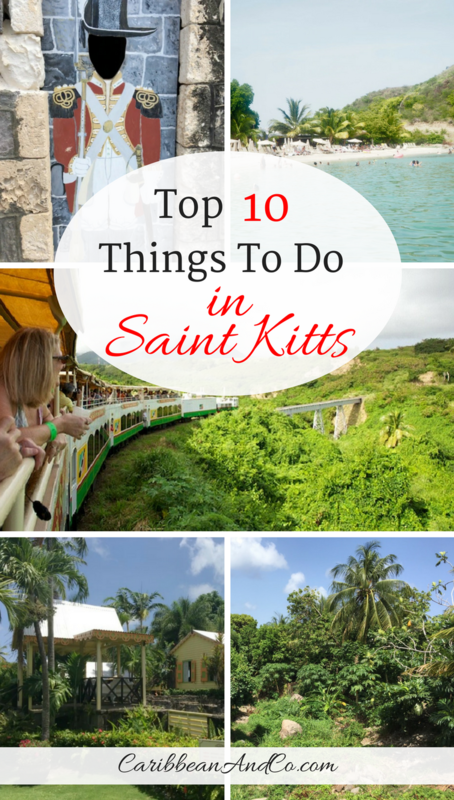 So which of these top ten things to do in St Kitts will you experience on your visit? Hopefully one or more. That said, for flight and hotel deals to St Kitts & Nevis and the rest of the Caribbean, check out our Caribbean travel partner, Expedia.com.